We are a Violin Shop committed to the restoration and sales of older European Violins, Violas, Cellos and their bows. Our mission is to serve the musical community with goods and services at a fair price. We serve professionals, young orchestral players, and students by providing instruments and bows from Europe and America, as well as high-quality beginner instruments and very affordable rentals. Our goal is to help you enjoy making music. I have been repairing and restoring stringed instruments my entire life while developing my passion for larger and more delicate restoration projects. My training started back in 1978 under Tom Hosmer, a Mittenwald Violin School Graduate, while living in New York. 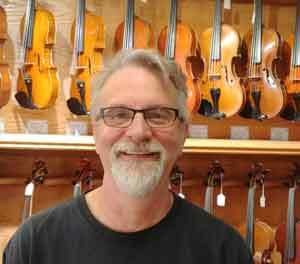 I have also gained years of experience doing larger restorations for other violin stores. A few years ago, I made a decision to let that part of my business go and open a shop to deal directly with the public, selling and repairing violins and their bows. I am part of a group of violin restorers that meet yearly to spend a week sharing ideas and new techniques in the Violin Society of America’s “Restoration Workshop” at the Oberlin Conservatory of Music. To my knowledge, this is the only group of its type, and together we help each other stay on top of the newest resources and techniques to advance our field. My training has included working with restorers such as Jean Jacques Fasnacht, Hans Nebel, Jeffery Holmes, David Burgess, Andrew Dipper, Andrew Fairfax, Iris Carr, Joe Grubaugh, John Becker, Roland Feller and Rodney Mohr. I have a personal affection for older American made instruments, as they tend to provide excellent value for our customers.